Of "DUTY", "HONOR" and "PRIDE"
You're special, don't you see! As you keep our country free! "The Keepers Of Our Country"
Click here to email the author. 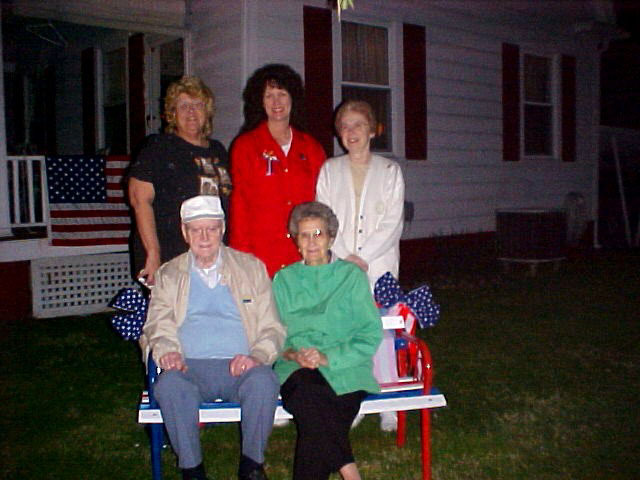 This tree stands in the front yard of Anna Jarrett at Falls View, West Virginia, in honor of ALL forces serving in Iraq. As the war began, Anna felt very badly as she talked with friends and neighbors and heard the agony in their voices as they spoke the concerns they had. She decided to show them how she felt by placing their loved one's names on display for all to see and remember. She spoke with her neighbors and they were all thrilled with the idea and all pitched in to help with the project. One keeps the lawn mowed, others placed yellow ribbons on all the poles in the village, some donated wood and paint for the display, some gave money to help with the cost of paper supplies, men joined together to place all the pieces where they belong, others are only a phone call away, if needed. 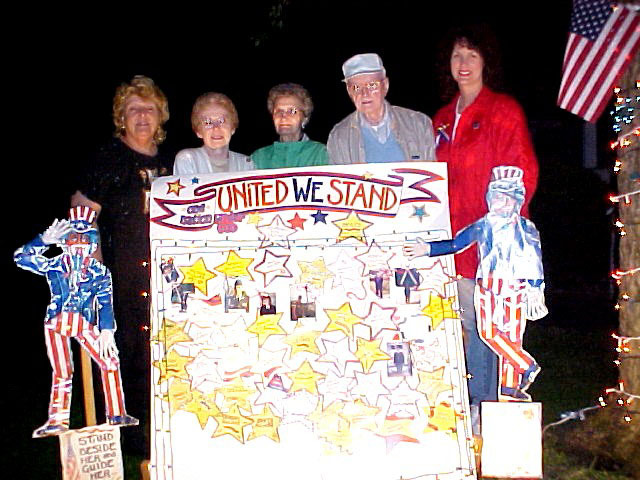 The signs were beautifully done by Kathy Seacrist, a neighbor. Anna wishes to express special thanks to Bob Nuttall, John Duda, Bob Moore, June Perdue, Alleise McClure and Priscilla Coleman for their help, both monetary and physical, in putting together this display. There are red, blue and silver stars hanging from branches of the tree. A large yellow bow with a smaller red, white and blue bow in its center, waves from its trunk. 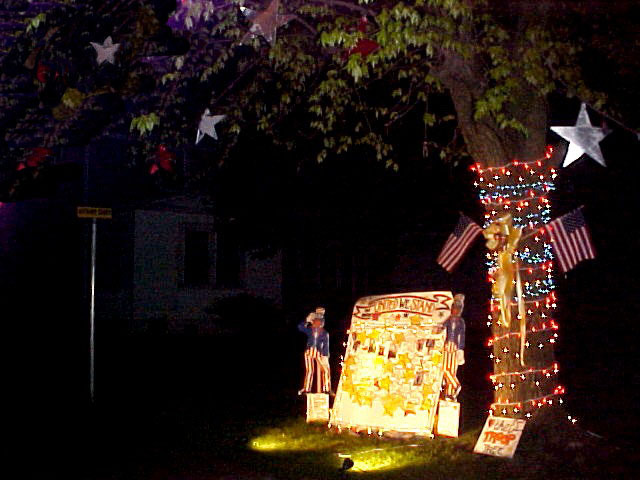 Many red, white and blue lights were placed around trunk of the tree. 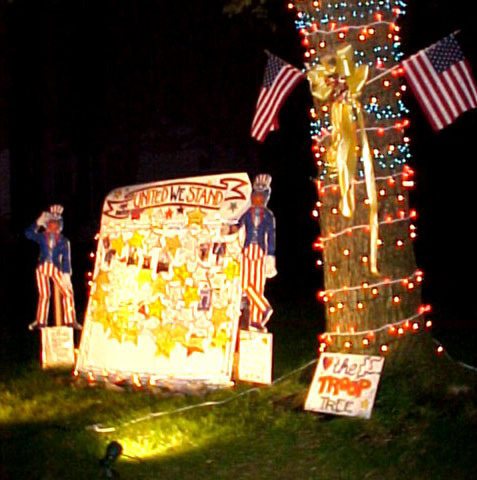 A special red, white and blue sign, "The Troop Tree", has place of honor at the base of the tree. 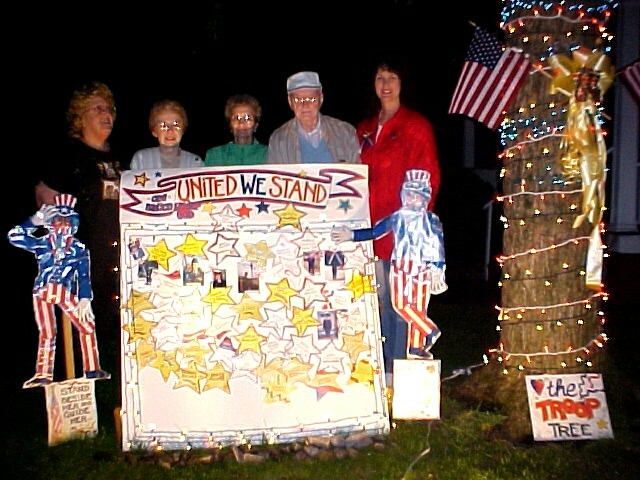 At left side of the tree, a display containing names of friends' and neighbors' loved ones, along with names of troops that are not known, but were given by acquaintances or folks passing by who wanted their loved one remembered also. 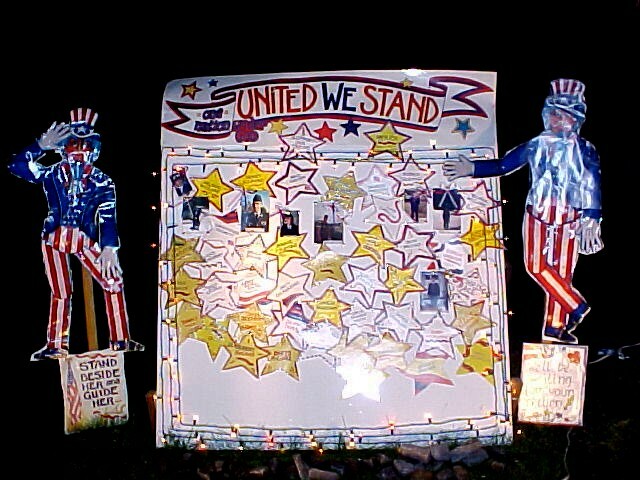 At top of the display, there are signs saying, "United We Stand" and "One Nation Under God". 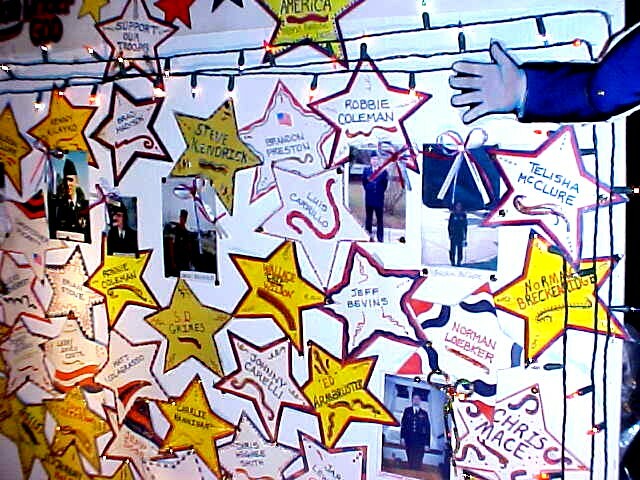 Names have been placed on decorated stars which are laminated to prevent weather damage. 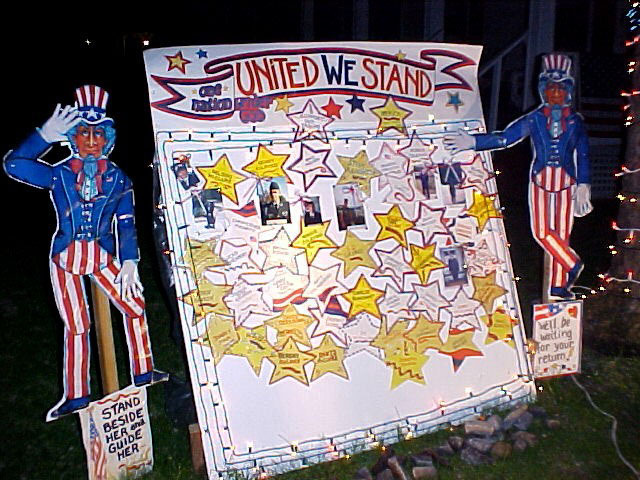 Uncle Sam stands at both sides of the display, saluting and pointing to the names, with a small sign under each likeness that says, "We are awaiting your return", and "Stand beside her and guide her". Old Glory waves in the background, both from the tree and the porch banister. 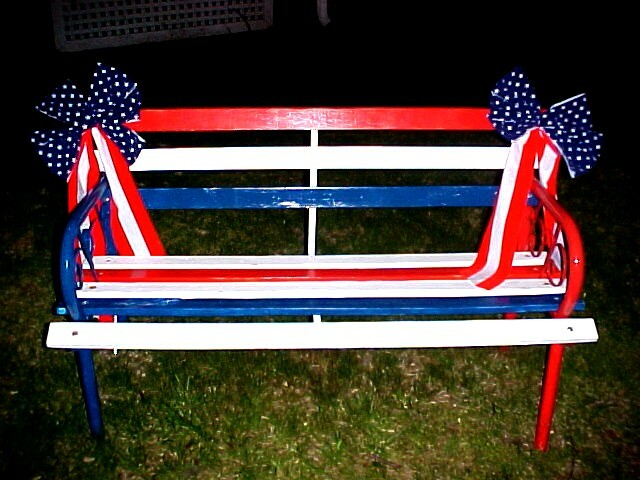 There are red, white and blue ribbons on a new red, white and blue bench placed at the right side of the tree. It's thinning paint is witness of the many folks who have stopped in tribute of the troops and to add names to the display. It's a perfect place for anyone to rest in solemn contemplation and prayer for safe return of all troops. 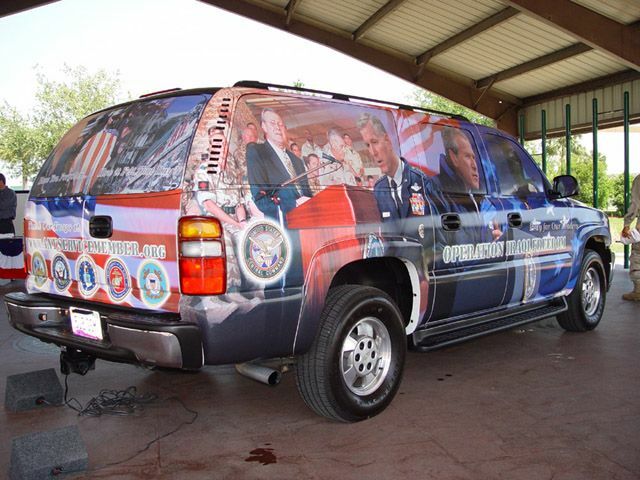 Folks have come from far and near, expressing their overwhelming support and gratitude to the brave men and women, whom they consider heroes, for fighting to keep the freedoms that we have, and also for others. If we didn't have these freedoms, think of what a sad world this would be. This project has been a very good way to show support from the neighbors, and also from strangers stopping by to see it and talk about their kin, and to know that they are not alone. his/her hometown, and relationship to you. Additional pictures of the Troop Tree display ~ Click to view enlargement. that we enjoy every day ~ and often take for granted. We pray for quick resolutions so they all may safely return to their families. Try to be UGLY Step UP!